I was thinking about my blog last time and I realized that I didn’t really do a good job highlighting Mary’s generosity. So! I want to highlight her generous spirit today by focusing on another Joyful Mystery — the Visitation. The Visitation just boggles my mind. Mary accepts the Holy Spirit and is now pregnant. Her betrothed, Joseph, is having a hard time understanding what this could mean. There is a lot going on in her life. After all, being pregnant is no fun, and then add this stress on top of it? That’s a lot for anybody to handle! Yet, what does she focus on? Her cousin, Elizabeth! During the Annunciation, the angel, Gabriel, informs her that her cousin, Elizabeth, who was thought barren is now pregnant, and so she sets off to minister to her older cousin. And that’s no easy journey — biblical scholars estimate that this journey was almost 100 miles from Nazareth to Ain Karim, which is the place tradition states that Elizabeth lived. Yet, Mary is so filled with charity and love for her cousin that she does it anyway, even with all these things going on in her life. 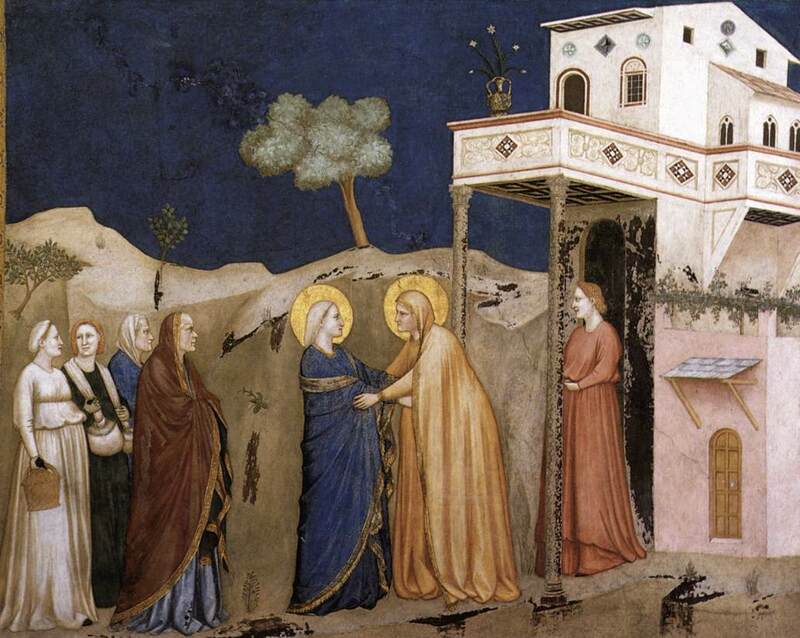 The Visitation, by Giotto, c. 1310s. Lower Church, San Francesco, Assisi, Italy. Her generosity, of course, does not end merely with her accepting God’s invitation to raise up Jesus, nor taking care of Elizabeth during Elizabeth’s third and last trimester. She generously takes care of Jesus, raising Him up in the precepts of the Lord as best as she can while He is but a helpless infant. Even as Jesus is adult, she prompts Jesus’s first miracle, causing him to turn water into wine. And she was there at the foot of the cross, watching as her son, the man who was once merely a baby stretched out in her lap, now stretched out on the cross, dying. And now? She is with Jesus as a saint, willing and ready to be generous with us, by directing us to her son, Jesus! May we not be afraid to ask her for her help, even when Christ, the Lord of the Universe, can seem out of reach! What is the first thing that you notice as you look at the picture? Why do you think that is? The Magnificat is one of the most famous songs of praise. What is the part that stands out to you the most? When have we been called to be generous with one another? Have we been as gracious as Mary? Help us be as generous as you and your mother were, using the examples that each of you set, both on this Earth and later in Heaven. This artwork is featured in my book, The Joyful Mysteries! For a peek inside, go here!